I have been using PSE 11 for a number of years. I figured I should update before the learning curve for the newest version became any steeper, so I purchased PSE 19 a few days ago. I keep a hardcopy photo album, and for this I create a collage for each page. I like to arrange the photos, often partially overlapping them, and leave room to add some text on the background about the photos or the event shown. 1. I single click on a photo, intending to change the size or proportions of the photo, frame, and mask all together, or to move them all to a different location on the page. Once in a while this works as expected, but more often, only the photo moves, leaving the frame unchanged, and part of the mask exposed on the page. 2. I want to send one photo and frame to the front or back, to partially overlap them on the page. 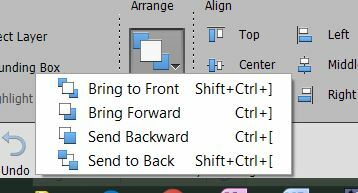 No matter what I do, the arrange tool remains greyed out in the tool options at the bottom of the screen. It's also unavailable from the right click menu. The option is only available is with the layers>arrange tab, and even with this seems difficult and convoluted. I wasn't able to find anything in the user manual that I hadn't already tried. I asked for help from the Adobe users forum, and a kind soul did his best to help, but I'm still unable to reliably make the changes I want to. It's frustrating to be unable to do something I found so routine in PSE 11. Screenshot below, hope that helps clarify the issues. I think I can help with #2. You must have a least two layers selected for the align features to be active. Welcome to the forum. I hope you like it here. I’m working in PSE 15 but imagine it works the same in PSE 19. 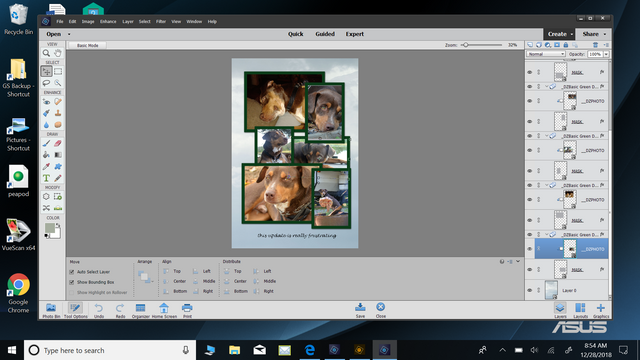 First issue – to move your photo together with the frame and mask you need to have all three selected in your layers panel. From your screen shot you would appear to have only the photo selected and not the mask. I can’t see a separate frame in your layers tab so I’m not sure if you have a separate frame or if you have put a stroke on your photo to act as a frame. Second issue – if you want to use the arrange tool then once again you have to have the photo, frame and mask all selected in the layers panel and then (in PSE 15) click on the little downward facing arrow and choose from the menu (see example below) OR select your photo, frame and mask and in a Windows OS hold down the Control key and press the left bracket key to send your items back one or Control and right bracket key to bring forward one. Just repeat to get to the position you want. Aaah I’ve just seen your question in the Adobe Forum and I think I now see what the problem is. When creating your page you have created several ‘Groups’ and all of these Groups are open in your layers tab. If you close a Group (which you can do by clicking on the little downward facing arrow in your Group Header) and have it selected in the layers tab you should be able to move all the items within the Group as one unit as I mentioned in my previous post. I have been using PSE 11 for a number of years. I figured I should update before the learning curve for the newest version became any steeper, so I purchased PSE 19 a few days ago. Hi funkyl, welcome aboard! Glad to have you here. I also have PSE 2019. It is a big jump going from PSE 11 to PSE 2019 but you can do it. Your screenshot shows you are working with Layer Groups. This feature is not available in PSE 11; it was introduced in PSE 15. Layer Groups are used to organize your layers when you have too many of them; it is a very common feature in template files which consist of many layers. Thanks, Major Major. It's actually the arrange feature, just to the left of the align feature that I can't access from the tool options, only from the layers>arrange tab at the top of the page. I hadn't got to the alignment feature yet, but I appreciate the info, as the layers panel on PSE 19 seems more complex than on PSE 11. BillieJean, your explanation clarified this nicely. I'm now consistently able to keep a group together and move it or change size and proportion. whew, much better! Thanks for the links - heading out now, but will check them out "next year" Happy New Year to you and all the other helpful folks here! Oops. Sorry for the misdirection. I didn't read your message correctly. You are most welcome! Post back if you need further help. Happy New Year to you too! BTW, here is something I forgot to mention . . .
You may want to keep PSE 11 installed. Back in PSE 12 Adobe removed several features due to the transition to PSE as a 64-bit app. For some features Adobe provides an alternative but not for others. Funkyl - I sent you a Private Message. Thanks for the heads up about keeping PSE 11. I was thinking of deleting it, but I will hang on to it for the time being. Lisa, you are most welcome! I believe it is a good idea to keep PSE 11 around. Each PSE version is an independent one; you can have multiple versions installed on your computer. I have nine versions, all living together in perfect harmony. What features from previous versions are not available in Adobe Photoshop Elements 12? There is also another reason why you may want to keep PSE 11. Are you into using third-party plug-ins (.8bf files)? If so, you need to keep this in mind. PSE 11 is a 32-bit progam; PSE 2019 is 64-bit. 32-bit plug-ins are not compatible with 64-bit hosting programs. This means that if you have a 32-bit plug-in and there is no 64-bit version of it, you won't be able to use it in PSE 2019.